It's now six weeks since the Woolsey fire burned 1,500 structures from Malibu to Calabasas. Many families are still couch-surfing, staying in hotels, and looking for rentals to live in temporarily. But some are finding that those rents have been hiked way up — more than they can afford with the payouts allowed by their insurers. Tiffany Holman of Malibou Lake had that experience recently when she tried to rent a small house that had been listed for $2,200 a month before her own house burned in the fire. But when she called the landlord, the price had spiked. "Oh, sorry hon, that was before the fire. Now right now, it's renting for $5,500," Holman said the landlord told her. Malibu Mayor Jefferson "Zuma Jay" Wagner said he'd been hearing similar stories from other community residents and real estate agents this week. "I have heard of $10,000-a-month homes going for $12,000 to $15,000 now," Wagner said. State law bars landlords from hiking rents more than 10 percent within a declared disaster zone for 180 days after a fire, earthquake or other incident. Prices on essential goods like food, water and fuel are limited to no more than 10 percent increases for 30 days after a disaster is declared. Vacancies in the burn area were already low, but the fire has exacerbated the shortage and led some landlords to take advantage of the heightened demand for rentals. Would-be renter Tiffany Holman said landlords can get away with rent gouging partly because potential renters are flush with insurance funds and are competing with each other for replacement housing, Holman said. She said she had been shut out of a couple of rentals after a bidding war erupted. In her case, her insurer is limiting its payout for rental housing to the pre-fire fair market price for the home she lost, so about $4,500 per month. Holman said that for that price, she has been unable to find a house big enough for her family of four and their five dogs. She expects to have to pay thousands of dollars extra out of pocket or squeeze her family into a small apartment. 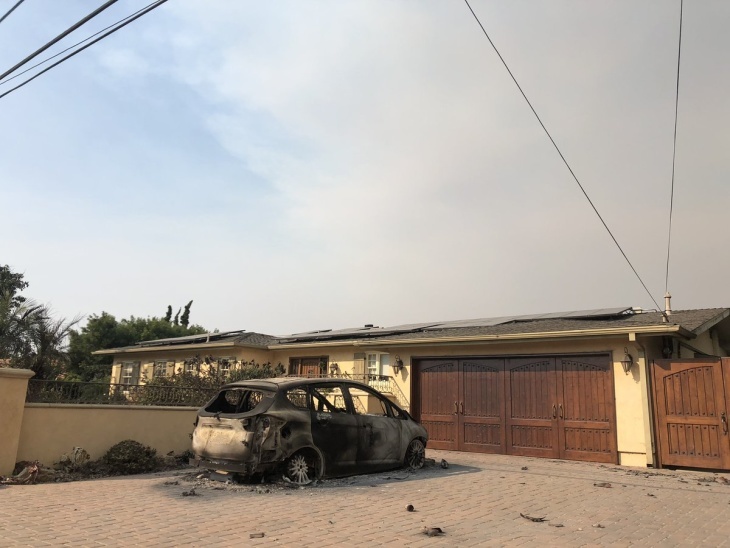 She's willing to live farther away, like in Newbury Park, but is somewhat limited as to location because her kids are still in school and she's having to be near her burned home in Malibou Lake to deal with insurance, cleanup and rebuilding. Her teenage son and daughter are living with separate friends and she has been couch-surfing and staying at a hotel whose rates have not been discounted for fire victims. Many of the burned homes are in wealthy areas, but not all. Residents of the Seminole Springs mobile home park lost 100 units to fire. Wagner said a typical home would rent for about $5,000 a month in the region. He said some landlords are basing their new rental prices on what they could earn from short-term rental sites like Airbnb. The state's law barring rent gouging in disaster areas applies to all of Los Angeles and Ventura counties and not just the burn areas, said Tara Gallegos, spokeswoman for Attorney General Xavier Becerra. She gave the example where a fire in San Diego County causes victims to evacuate to neighboring Imperial County, hotels or landlords in the neighboring county may not raise prices more than 10 percent to take advantage of the heightened demand for housing. "The statute does not restrict its protection to a city or county where the emergency or disaster is located. It is intended to prevent price gouging anywhere in the state where there is increased consumer demand as a result of the declared emergency," she said. "Rent gouging compounds the trauma caused by the displacement," said Joseph Nicchitta, director of the Los Angeles County Department of Consumer and Business Affairs. "It's predatory, plain and simple." His department is taking rent gouging complaints at 800-593-8222. As of Tuesday, the Los Angeles County District Attorney's office had not received any complaints from local police or sheriff's offices, a spokesman said. Jenn Kurtz, an organizer of the nonprofit LV Fire Relief, said families might not be reporting rent gouging, partly because they don't know they can complain, but also because they have bigger issues to deal with. "The problem is all the families are so desperate to find places, that they're willing to pay because they need a place to stay," Kurtz said. This article was originally published Dec. 19,, 2018.